Are you looking for a Seniors strength class Everton Park? 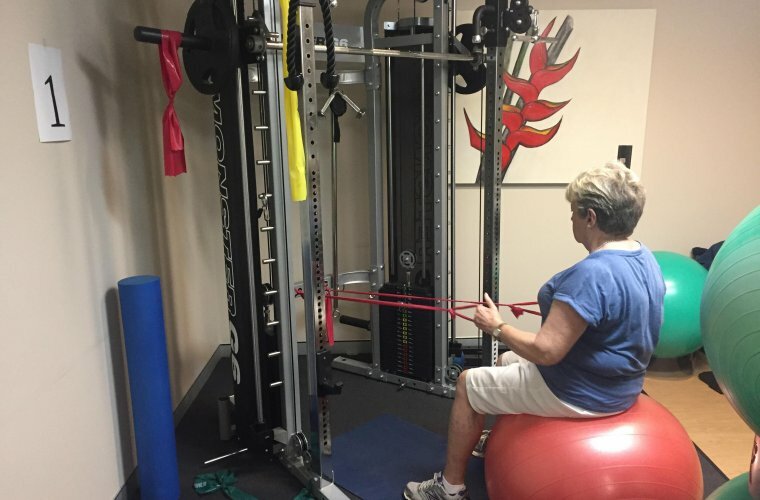 Strength and balance classes are a fantastic way to recover from an injury or surgery, or to simply maintain good health and mobility into your later years. No matter your fitness level, we encourage you to try our friendly Seniors classes led by a qualified physiotherapist today! Suited to people aged over 50, North West Physiotherapy offer multiple classes each week (shown below). To book, call us on 3353 4111 or visit our clinic at Shop 21 North West Plaza, 97 Flockton Street, Everton Park. What is a Seniors Strength and Balance Class? the other half on upper limb, lower limb and core strength exercises. Our enjoyable classes cater for all fitness levels and sessions are tailored to help achieve each participant’s exercise and lifestyle goals. At North West Physiotherapy, our supervising physiotherapist can easily make adjustments to any exercise to ensure safe and effective exercise or rehabilitation based on your personal needs. Setting achievable training goals to help continually improve your strength and balance. Who should participate in a Strength and Balance Class? Anyone looking to maintain their mobility, strength, balance and flexibility in their later years should ensure they are doing some form of regular exercise every week. Here at North West Physiotherapy Everton Park, we pride ourselves on creating a very positive and friendly environment, ensuring you feel welcome from your very first Seniors Class. Regardless of your physical attributes and exercise goal, our physiotherapists can monitor and modify your exercises to ensure a challenging but safe whole-body workout. Prior to your first class, all participants will be required to undergo an assessment to identify your current physical strengths and weaknesses (such as mobility, strength, coordination and balance). Your physiotherapist will record your scores at your initial assessment, reassessing the same tests at regular intervals to track your improvements. This is not designed to intimidate, rather provide a benchmark so we can celebrate your wins with you! All fitness and mobility levels are welcome and encouraged to join classes which run for about an hour. Participants must be able to negotiate a flight of stairs. Book your place by calling North West Physio on 3353 4111 or dropping into our clinic at Shop 21 North West Plaza, 97 Flockton Street, Everton Park. North West Physiotherapy is your one-stop pain relief and healthy living practice in Brisbane. With three clinics across North Brisbane; Everton Park, Keperra and Eatons Hill, our aim is to provide holistic healthcare solution to suit your specific lifestyle. Our services include Physiotherapy, Sports Physio, Hydrotherapy, Pilates, Podiatry, Dry Needling, Massage, Womens Health, and Seniors Strength and Balance Classes. Please note that services vary across our clinics. Appointments available 6am – 7:30pm Monday to Friday, and 8am – 12:30pm on Saturdays. Book online here or call us on 07 3353 4111.